Create an infinite variety of artistic images. Is there a better alternative to quadrium? Is quadrium really the best app in Author Tools category? Will quadrium work good on macOS 10.13.4? 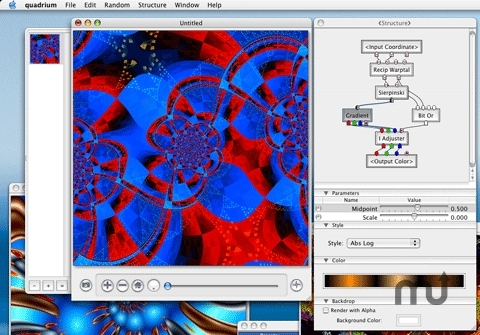 quadrium is an application that combines mathematics, data flow models, and genetic programming techniques, wrapped into a standard Mac user interface that allows you to create an infinite variety of artistic images, textures, and backgrounds. Version 2.3: Release notes were unavailable when this listing was updated. quadrium needs a rating. Be the first to rate this app and get the discussion started!